Force 10 gale today and the seas are awesome but it’s behind us and so not nearly as radical an experience as it might have been. Wild weather in cold seas - looking out through the window of the Bridge. In the image above, I was looking out through the window of the Bridge, in a position of comfort. I took the image above from the safety of a protected open doorway opening onto the deck. No way it was safe to actually go out on deck. I heard of a German tourist who had gone missing earlier that season from a cruise ship in the Drake Passage. They worked out that he must have gone to a favourite place at the stern to take photographs and been swept away by a huge wave. 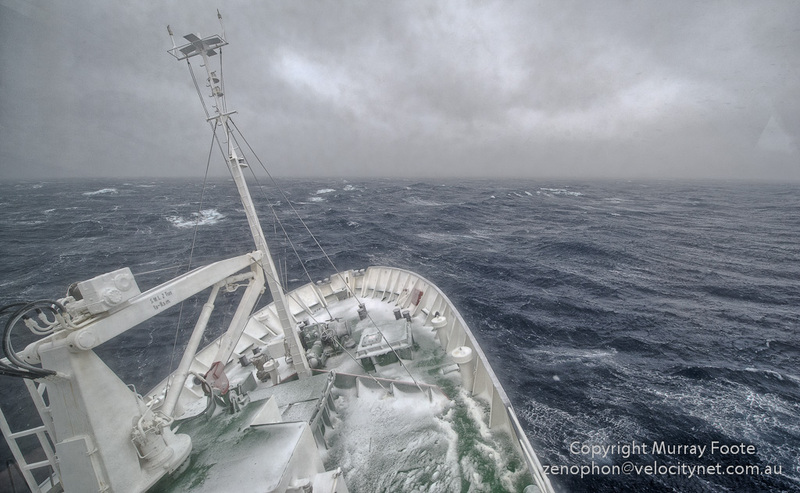 This entry was posted in Drake Passage and tagged Drake Passage, Photography, Travel.